GPS is very unreliable in this area. Such systems have sent numerous visitors in the wrong direction and onto dirt roads. 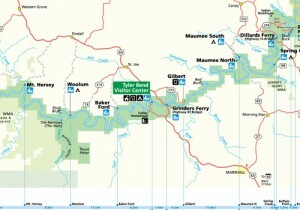 Please refer to an Arkansas Highway map or park map. Buffalo National River is a long, narrow park that is crossed by three main highways. 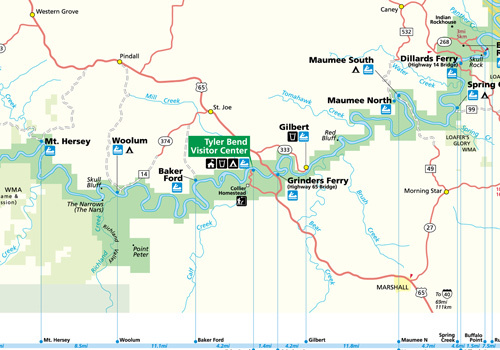 Using Harrison as a starting point: To reach the Upper District (Jasper or Ponca AR area), visitors travel south from Harrison on Highway 7, or Highway 43; To reach the Middle District (Tyler Bend area), visitors travel 31 miles south of Harrison on Highway 65; To reach the Lower District (Buffalo Point area), visitors take Highway 65 south from Harrison for five miles, then take Highway 62/412 to the east to Yellville, and Highway 14 south.